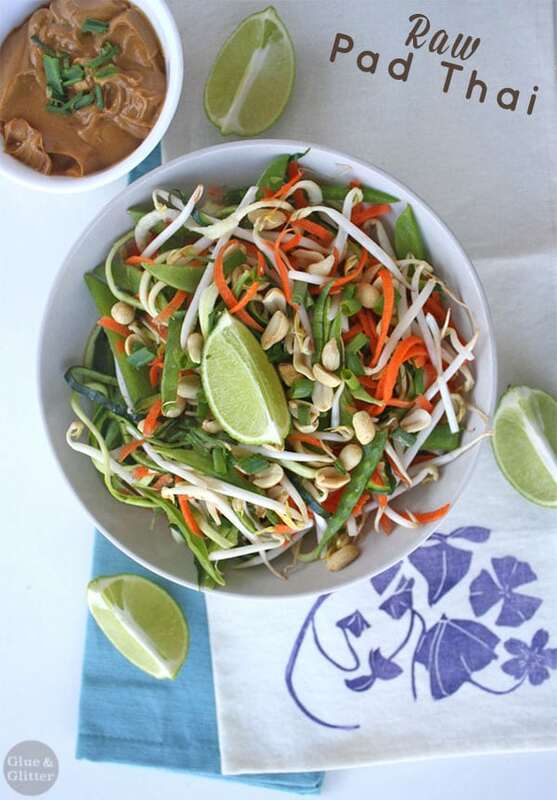 Raw Pad Thai recipe from Beverly Lynn Bennett’s new book, Spiralize!, features a super easy blender peanut sauce. Fresh raw pad Thai in citrusy, gingered peanut sauce is easy to make and as good as its restaurant counterparts. You guys know how I love a blender peanut sauce, and Bennett’s version is just lovely. Like my recipe, you just toss everything into the blender, and let it go. It takes only a few minutes to make! Once the sauce is ready, it’s time to spiralize the zucchini and carrots. These are the “noodles” for your raw pad Thai. 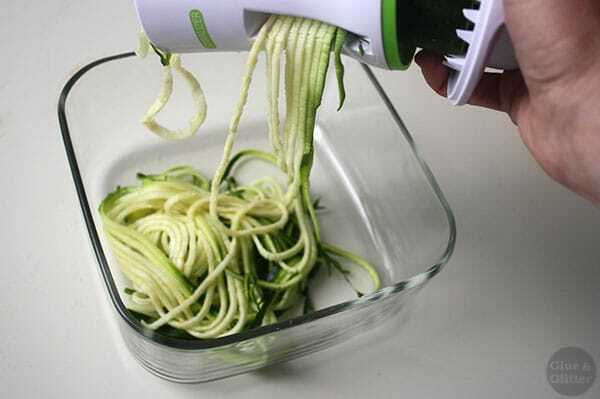 Spiralizing zucchini to make raw pad Thai noodles. If you don’t have a spiralizer, you use around 1 cup pre-shredded carrots and sub 1/2 cup extra bean sprouts for the zucchini. I recommend investing in a spiralizer, though. I just got one, and it’s so much fun! You can find one for less than $20, and it works great in this recipe. 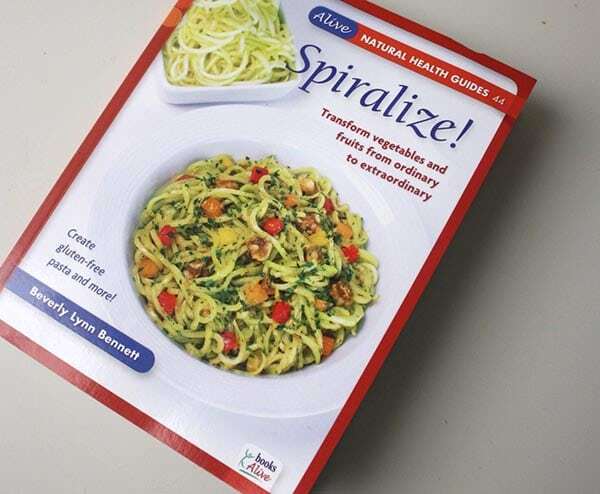 Spiralize looks like an unassuming book on its face, but inside are tons of amazing, delicious recipes. If you’ve been wanting to get a spiralizer and learn how to use it, this book is a great place to start. Not only does the book have breakfasts, snacks, soups, salads, and main dishes, but it’s a good starter guide to spiralizing. There’s a handy guide to choosing the right spiralizer for your needs, a guide to which fruit and veggies work best in a spiralizer, and cleaning and safety tips. The raw pad Thai recipe in the book caught my eye, because that’s my go-to any time I’m at a fancy raw vegan place. My mom and I had the best raw pad Thai ever at Cafe 118 in Winter Park, FL, and this recipe gives that dish a run for its money. 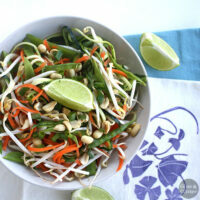 Raw Pad Thai Recipe from Spiralize! Put the peanut butter, tamari, oil, lime zest and juice, sugar, garlic, ginger, and red pepper flakes in a blender, and process until smooth, stopping once to scrape down the blender jar. 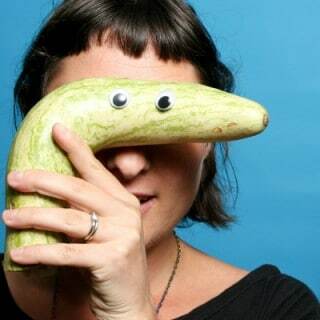 Use a tri-blade spiralizer, vertical spiral slicer, or handheld hourglass spiral slicer to cut the zucchini and carrots into thin spaghetti strands, then cut with a knife into 4-inch lengths. Transfer to a large bowl and add the sprouts, pea pods, cabbage, green onions, and cilantro, and toss gently. Add the sauce and toss until evenly distributed. Sprinkle with the peanuts. Serve immediately. My substitutions are noted in parentheses. VARIATION: For a peanut-free version, replace the peanut butter with another nut or seed butter and replace the chopped peanuts with other chopped nuts or seeds. I absolutely love Pad Thai!! I spent two weeks in Thailand in September and I just couldn’t get enough of it. 🙂 Yours looks so delicious! This looks so vibrant and alive. Perfect for me. Yay! I have been wanting a spiralizer for quite awhile now. I really need to JUST DO IT! Ha! This looks like the perfect dish to eat after all the heavy holiday treats. Looks delicious!